Users of sharing sites like Couchsurfing and Eatwith get a more personal experience while on vacation. Usually foreign guests are surprised by the small Russian apartments and the tradition of removing footwear at the entrance. Even as hoteliers in Russia worry about the downturn in demand, the number of people couchsurfing in the country is on the rise. Alexei Korykin, who lives in the town of Blagoveshchensk in the Amur Region of Russia’s Far East, has not been abroad for a long time. But he has hosted guests from Australia, Brazil, Germany, Moldova, South Korea and China, among others. “In our Far East such guests are rarities,” Korykin said. “My relatives from the village always invite me to bring my foreign friends so that they can see how people live in the village.” Foreigners who manage to travel to Blagoveshchensk can expect significantly different experiences in Russia from those who only visit Moscow and St. Petersburg. “My guests find many unexpected things in Russia. For example, Germans Tim and Dominic saw a movie about the Great Patriotic War for the first time and even befriended a veteran. And a Canadian by the name of Felix would never forget his visit to the banya,” Korykin said, adding that the most difficult thing for foreign visitor to his hometown to cope with were the ticks. The map of Russian couchsurfing hosts has some interesting dynamics. For example, there are few users in the Black Sea resort town of Sochi, but there are many in Grozny, the capital of Chechnya. Yusup Yerazov from Grozny has been using Couchsurfing.com for only a year, but he has dozens of comments on his page from Russian, European and Chinese tourists. Another North Caucasus couchsurfer, Bagdat Tumalaev from Makhachkala in Dagestan, says that most of his guests are from Europe: Italy, Spain, Serbia, Switzerland, Germany and Cyprus. “My guests often compare Makhachkala to Istanbul. Europeans like the local fruits and vegetables.” Tumalaev says that one problem his European guests have is that they are often vegetarians, and Caucasian cuisine is famous for grilled meats. “Guests coming to the Caucasus have always been treated specially. Tourists are fascinated by the local traditions, customs and cuisine. I try showing my guests the traditional Chechnya. There are many myths about Grozny, but I try to show them the realcity,” Yerazov said. “I’ve found many good friends on the Couchsurfing site,” said William McGuinness, an American from Yonkers, N.Y., who lives in Moscow, although he noted that he has never actually stayed in a couchsurfing situation. Kat Hodgson, a Colorado native who has often traveled to the Urals city of Ufa for work, said that while her employer pays for her to stay in a hotel, she used Couchsurfing to find a tour guide. Aliya Salimova “drove us around Ufa and pointed out landmarks, then took us to a Bashkir restaurant so we could try the local food. On our last night in Ufa, we didn’t have a hotel room, so Aliya hosted us,” Hodgson said, adding that she recommended Aliya to another American friend visiting Ufa to attend a hockey match two years later. Russian couchsurfers agree that foreigners are often surprised by the small size of typical Russian apartments and their tiny kitchens as well as by the custom of taking off shoes upon entering a house. They are also often surprised by the amount of vodka Russians don’t drink. “They are convinced that we drink vodka the whole day and are therefore surprised when they see we don’t,” said Maria, a couchsurfer from Kazan. One group hopes that tourists to Russia will focus on the country’s cuisine rather than its beverages. EatWith gives local residents an opportunity to practice their culinary skills on travelers, who get an inexpensive homemade meal in return. Hosts post a description of their food and atmosphere on the EatWith site, the cost of a meal and the dates and times the opportunity is available. In Russia the service has operated since 2013, but only in Moscow and St. Petersburg. Before being listed on the site, hosts must participate in a Skype interview with the project’s organizers and then invite the EatWith ambassador to dinner. 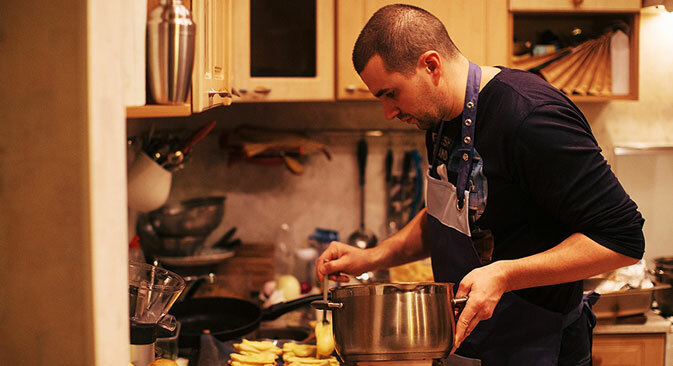 Professional chef Kirill Olkhovsky is also an EatWith user. He says that the format of a restaurant does not allow the chef to communicate with the people he cooks for, but EatWith does.